Part of the Heirloom Sleigh Collection, this beautiful mule chest features the same elegant styling and attention to detail as the rest of the collection. Like the sleigh beds, dressers and nightstands in the collection, the Amish will build your sleigh mule chest out of solid cherry, solid oak, quarter-sawn white oak, hickory, maple and elm. Price will be shown for solid oak; Please contact us for pricing in other woods. The heirloom sleigh mule chest features 6 half-width drawers, 3 third-width drawers, 3 velvet-lined hidden drawers between the top and bottom sections and 2 sets of doors in the top section concealing shelves and additional drawers (see view of it open by clicking below). We also have a close-up image of the door/drawer hardware shown below for your convenience. 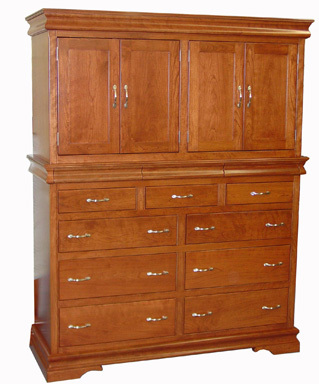 This quality piece of Amish made bedroom furniture is sure to be handed down for generations to come!